This is the second time we review an Audiosophia product. You might remember my test of the I-50 jm published in January 2005, exactly 3 years ago. It was a mid-class integrated amplifier, excellently crafted, with a nice finish and an extremely refined sound. Its price was around 2000 € so definitely nothing near what I call "entry-level" class. The guys at Audiosophia have decided to attack the "basic class" of the market with a series of amplifiers and speakers that should help novices entering the world of real HiFi: two integrated amps (this I40R under test and its bigger brother I100R) and two loudspeakers (J1, J2 and J3, ranging from 400 to 900 €). This is a very brave decision, considering the tough competition in the entry-level HiFi arena. It is hard, for a small Italian company, to fight directly against the big boys like NAD, Rotel, Harman Kardon etc. For this reason I was curious as a cat to test this integrated amp. The I40R amplifier sports a "full-silver" chassis, exactly like its more expensive brothers and even the presence of 4 massive aluminium feet recalls some of the "family feeling". The size of the knobs and switches make it look similar to some '80s components (mainly from Denon, Yamaha...), a kind of a vintage touch that might have some appeal. Hence, it shouldn't be a surprise to find tone controls knobs on this amplifier, something that is becoming rarer and rarer. Thanks God, these controls can be excluded from the signal path via a TONE switch. Of course, even a balance control is supplied. Three red leds light up when powering on the unit. One indicates actual power on, the other two seem to indicate each channel is up and running (this is just my assumption). A delay connects the speakers a couple of seconds after the unit has been switched on. The inputs selector lets you choose 4 LINE sources that can be connected to standard nickel-plated RCAs. Yes, no gold-plated connectors here. Still in the rear you have the speakers binding posts (bananas allowed) and the mains cable, which isn't of the detachable variety but appears to be shielded like many audiophile after-market mains cables. Hence you can't "upgrade" it but its quality appears to be higher than usual. A conservative and pessimistic 8 Ohm minimum load is recommended. The 4 line inputs weren't created all equal: the CD one has different sensitivity and load impedance: 2V-20kOhm instead of 0.5V - 47 kOhm. This choice, already seen on other preamps or integrated amplifiers, should be an attempt to offer a proper load to low impedance output CD players (or line sources). A more careful look at the rear panel unveils a fifth and mysterious LINE input labelled AUX2. There's no way to choose this input via the sources selector. Moreover even a TAPE OUT output is available though there's no mention of it in the fron panel. When I asked the designer about these strange findings he replied the amp was almost a prototype. May I gently ask the manufacturers to send just current "production" components? This is not the first time this happens and is becoming quite annoying. The last thing I wish to do in my life is working as (unpaid) "beta-tester" for pre-production HiFi components. The efforts to achieve the best quality/price ratio have caused a reduction of the number of "features". For example, a remote control isn't available and I don't think this can be installed as "optional". Remote controls, even on super-budget HiFi components, are quite common nowadays. As said, RCA connectors aren't of the gold plated variety, another proof of the effort for keeping price low. A closer look at the inside of the amp reveals other interesting aspects of this product. The PSU uses a toroidal transformer by EagleRise Electric (a Chinese Company) and 4 Chinese caps (10,000 uF each). The power stage uses Toshiba transistors. Taking a closer look at the circuit board one notices all passive components are made in China, as well. I haven't been able to spot a single "Made in Italy" sticker inside or outside the amp. The printed board has several unused holes, which means this design can be used as base to make different amplifiers, depending on manufacturer's requirements. There are even holes for screws that haven't been used. This means the printed board wasn't meant for the cabinet that's been used by Audiosophia. Audiosophia is a small brand, hence availability is scarce, even here in Italy. They sometimes partecipate to national HiFi Shows where their products can be evaluated (though partially). 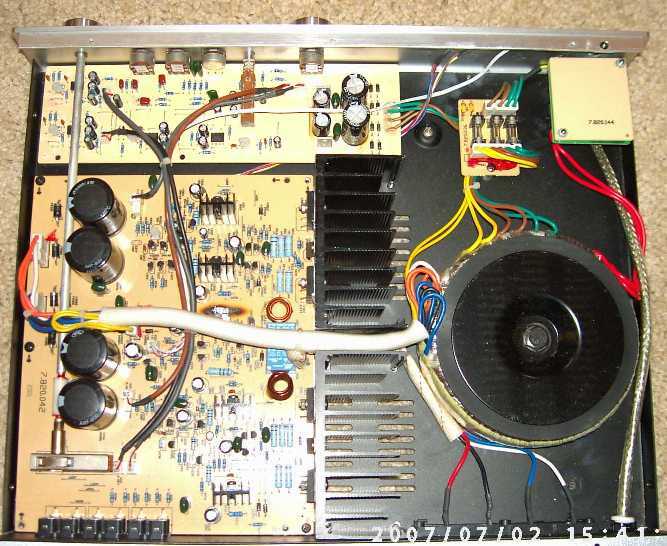 A typical customer of this amplifier isn't a regular audiophile. Considering its features (tone controls, for example), its selling price and the rather high power/price ratio this amplifier should be mostly welcomed by generic Music lovers on a budget, with no signs of Audiophilia Nervosa. For this reason the tonal balance tends to favour the mid-bass and the bass range, hence the unit sounds "bigger" than it actually is. Moreover, the mid and the high range appear a bit shy so to compensate those cheap overbright loudspeakers and sources that might be its natural ancillaries. Investigating a little bit more, one can discover that the bass range is more powerful than extended while the first octave appear a bit behind the rest. My suspect is that the midbass is slightly "boosted" hence the lower bass sounds less powerful than it should be. Summarizing, one gets the feeling of a "solid" and warm sound, with a slight boost in the 100-150 Hz area. Considering the typical speakers that will be connected to this amp, this attitude can't be considered a real problem. Slightly more serious is the fact this amp seems unable to clearly reproduce complex sounds in the bass frequencies area. When you need - at the very same time - power, extension and articulation, the I-40R grasps for breath. The mid range, as said, is on the shy side and lacks some verve and spark to make the Music lively and exciting. Guitars pizzicatos and percussive sounds of the piano, for example, appear a bit lifeless. This, paired with some confusion on multiple voices, makes the performance definitely not exciting. When the going gets rough, even sibilants start becoming too unpleasant. The high range has a slight roll-off, which should be welcomed on entry-level set-ups. On the other hand harmonic richness is missing somehow. You get the fundamental note but the subsequent harmonic structure of the note isn't rich as it should be. Once, these inadequacies were quite "normal" on budget amplifiers. Nowadays, with Class D entry-level amplifiers, which do very well in this department, it is harder to forgive. For example, comparing the I-40R to the Trends Audio TA 10.1, power output differencies aside, there's no match to speak of, the TA 10.1 wins hands down. Just after a couple of minutes it becomes impossible to go back to the I40R. The lack of micro-informations, details and harmonics makes the comparison unfair and quite embarassing. Anyway, while it's true the TA 10.1 sounds much better, the I40R is much more powerful, offers more features and inputs. A die-hard audiophile would buy the TA 10.1 (provided his speakers have adequate sensitivity) while a generic Music lover would buy the I40R, especially if he needs power and has the necessity to connect more than one source. The power output of this amplifier appears, under certain circumstances, even higher than its claimed value (60 watts @ 8 Ohm). Even if your listening room is large and you like loud listening levels this amp will get the job done. There's always a reservoir of power that helps reproducing even high-dynamic recordings. Considering its price, this is a very welcomed bonus: it won't run out of steam easily. Unluckily, while you may get "quantity" you don't get "quality". Confusion takes the lead when the going gets rough. It doesn't matter whether the listening level is high or not, when the Music gets "complicated" this amp loses the plot. From time to time I use non-audiophile recordings to test HiFi components under "real life" circumstances. One of these is certainly AC/DC "Live": good old hard-rock, plain and simple, a live recording which is sometimes "dirt" but always plenty of energy and emotional involvement. If your HiFi system is able to reproduce the impact of such a band playing live then this recording can sound extremely involving and exciting (provided you like the genre ;-)). Needless to say, this recording needs to be played insanely loud. This is the reason why many HiFi components fail to reproduce it correctly. I was playing this live gig with the small, underpowered TA 10.1. Everything was just "right" (pace, timing and rhythm) except brutal impact. If you need to get some serious "air guitar" effect you need decibels (and hence watts). Trying to get more impact I've decided to connect the I40R. And...what a surprise! Power output was adequate but all the magic was gone, especially pace and rhythm. Guitars (hey, there's two of 'em!) were mixed together and confused, voice was unbearable while electric bass and drums sounded like a single instrument! In other words, I haven't been able to exploit the extra power output! With better sounding recordings the I40R performs better and there's no trace of confusion at all. With clean and simple signals it feels just at home (Pat Metheny's "Still life (talking)" now playing). From an almost entry-level integrated amplifier one shouldn't expect much in this department. Anyway, its 3D image has correct geometric proportions, it is not wide nor focused but it isn't all that bad. Players and singers appear correctly displaced inside the 3D soundstage while their contours are definitely blurred. The depth of the image is good, considering the price tag. It is impossible to compare its performance in this area with the aforementioned Class D amplifiers, like the TA 10.1. Just consider this small gem is capable of creating a soundstage so wide and deep that much more expensive amps can only dream of. Again, one shouldn't forget the potential customer of the Audiosophia I40R: perhaps 3D soundstaging is the last of his needs. He will use speakers that don't image well and he will hang 'em high on a bookshelf, very close to the rear wall. Getting a reasonable virtual image under these assumptions is almost impossible. This is a very user-friendly amplifier. Considering its weight and the amonut of heat it produces I'd just place it on a solid HiFi rack shelf, with no other component close to it. The stock feet scream "high-end!" but I'm pretty sure something better can be experimented. I don't judge a book by the cover. The stock mains cable can't be upgraded and perhaps this isn't strictly necessary, as it appears to be of reasonable quality (shielded). As for suggested partners I'd choose small bookshelf loudspeakers that may need a "kick" in the bass range area. The slightly "loudness" yet warm personality of this amp may help. I'd avoid overbright loudspeakers and sources, though. Not surprisingly, this amp has performed nicely with the small Audiosophia J1 loudspeakers (soon to be reviewed). The match with these speakers is certainly interesting. Still, even with these speakers, the feeling of a shy mid range is there. Switching to another integrated amp (Obsession AP30 mkII, an EL34 push-pull tubed amp, soon on TNT-Audio) which is more or less in the same price league, has proved this shyness once again. Manufacturing & finish. Comparing this amp to its bigger brothers shows how many price-reduction choices have been made. Nonetheless, it appears more high-endish than many competitors which use, for example, full plastic front fascias. Look isn't everything, but certainly this amp looks different than the rest, at least in this price area. Anyway, gold-plated RCAs, remote control, headphones output and eventually a phono input would have been welcomed, considering what the competitors offer for the very same money. Tone controls lack a useful central "zero" position, so it is hard to detect whether they're working or not without using the tone defeat switch. Max boost and min boost positions are not symmetric, so finding the right "zero" position is even harder. The same happens with the balance control. Not good. Speaking of competitors, in the same price range one can buy, for example, the NAD C352, 80 watts per channel, remote control, 7 line inputs, headphone output, and pre out/main in loop. Also, there's the Rotel RA 05, 40 watts per channel, remote, headphone output and even MM phono input! Considering even these amps are mostly made in China (exactly like the I40R) the comparison isn't unfair. That said, the I40R should cost less (or offer more). I've been told this was almost a pre-production unit. For this reason there wasn't any owner's manual and the shipping box was a very simple cardboard box with two small "dampers" inside. Sound. My personal "wish list" reads as follows: better mid-range, richer high range, more power for the first octave, better harmonic content, less confusion on complex Music. No, this is NOT a budget-version of the I50 jm! These amps have very little in common. Just the brand name. Making good and cheap HiFi components proves to be not an easy task, especially for small Western World Companies. For this reason many small (or new) HiFi Companies prefer to hit the market with price-no-object components, so to avoid the "value for money" dangerous trap. In my opinion, it should cost much less, considering what the market is offering nowadays.